A city of elegance, the allure of Vienna emanates from its baroque architecture, rich musical past and enthralling cultural gems. Here’s how to make the most of a weekend in Vienna, Austria. The beating heart of Austria, a landlocked nation, the city of Vienna (Wien) is located in the north-east of the country. Situated equidistant from the borders of Czech Republic to the north, Slovakia to the east and Hungary to the south-east. Just over two hours in duration, the flight to Austria’s capital is a comfortable length and ideal for those eager to monopolise their time in the city. However, for those who have more time I would recommend approaching Vienna by train. You will find yourself enthralled as you journey past small villages that display the endearing traditional chalet style houses, snow topped mountains and lush green valleys. Giving visitors access to all of Vienna’s top attractions along with fast track entry, and free access to Hop on Hop Off sightseeing tours, the Vienna Pass is perfect for those looking to make the most of their city break in Vienna. For easy access to transportation around the city add on the Vienna Travelcard and make use of the cities network of undergrounds, trains and buses. Classic Collection Holidays concierge team are available to organise the Vienna Pass and/or travel pack, for you during your stay. If you wish to add this on to your booking, please call 0800 008 7289. With an array of cultural attractions at your fingertips, begin your enriching cultural escapades by viewing the morning exercises of the Lipizzans in the Spanish Riding School. 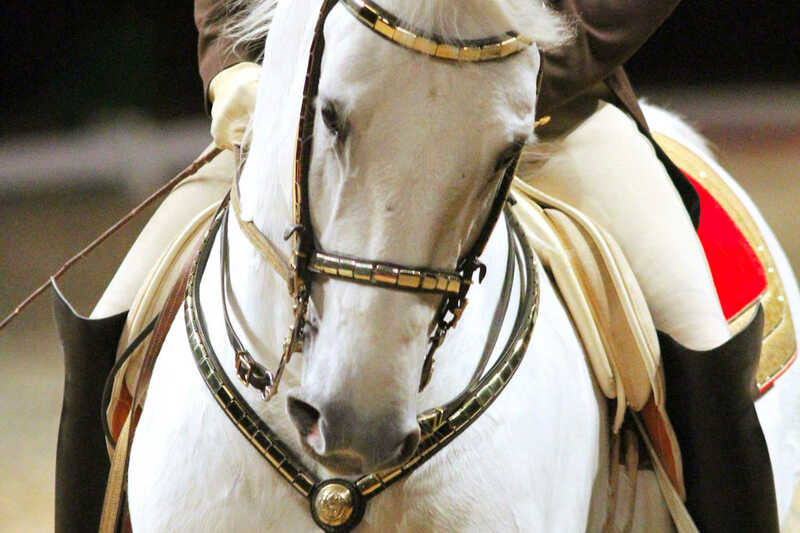 Costing €15 (with discounts available) or free with the Vienna Pass, you can admire the young grey stallions and the ‘white star’ stallions as they train to beautiful Viennese music. Training sessions begin at 10pm, lasting two hours. Visit the Spanish Riding School website to view events taking place during your stay. Practicing for more than 450 years, the Spanish Riding School is an institution that continues to nurture classic equitation in the Renaissance tradition of the Haute Ecole. Enjoying long breaks in the Heldenburg in Lower Austria, the stallions are well looked after, with their strict training regime accompanied by serene relaxation time. After spending the morning in the company of the magnificent Lipizzans. Take time to stretch your legs and go in-search of your ideal lunchtime eatery. For quirky culinary delights, visit Schachtelwirt. Served in folded brown cardboard boxes, much like American Chinese takeaway containers, the delicious culinary delights can be eaten in the eatery or on the go. Serving affordable Austrian cuisine, friendly and knowledgeable staff hand-make the dishes with local ingredients ensuring dishes are fresh and full of flavour. With the menu changing every week, there are always new delights to discover. Schachtelwirt is located just a 10 minute walk from the Spanish Riding School, towards the river. The restaurant is open Monday 12:00 – 15:00, Tuesday to Friday 11:30-21:00 and Saturday 12:00-22:00. After lunch make your way to Stephenplatz. Just a 5 minute walk, here you can admire the magnificent St Stephen’s Cathedral. 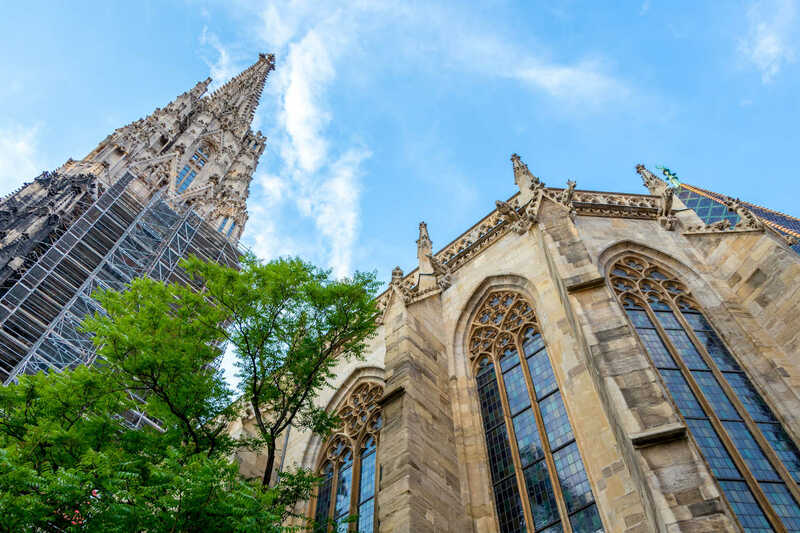 A superb example of Romanesque architecture, the Cathedral has a history spanning over 850 years, with its continued renovations and repairs resulting a striking masterpiece that stands in the heart of Vienna. Free entry makes it a popular location to escape the heat of the day during the summer months, with the awe-inspiring interior offering a feast for the eyes. A tour of the treasury is free with the Vienna Pass. From Stephenplatz you can climb aboard a horse and carriage and let a Viennese fiaker take you on the tour of the city’s top attractions. 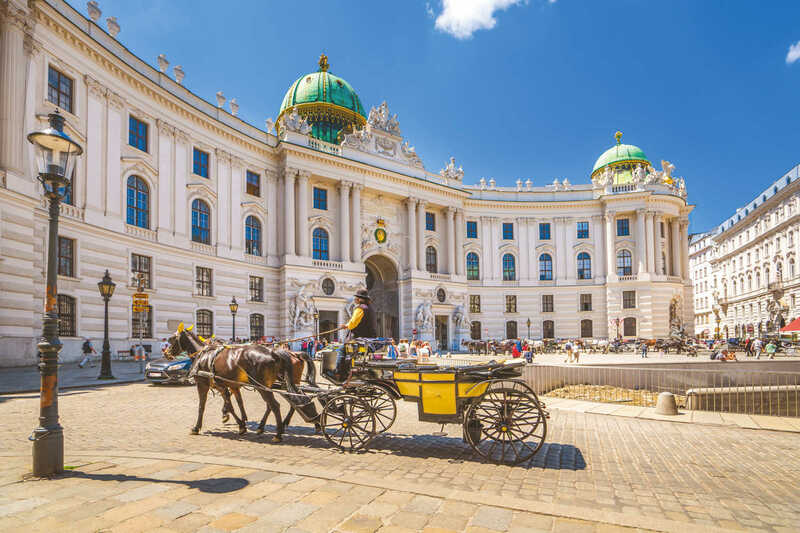 The tour will take you past some of Vienna’s most notable buildings including, among others, the Imperial Hofburg Palace, Palais Pallavincini, Augustinerchurch and the famous Vienna Opera. Expect a 60 minute round trip to cost around €110. After a day of sightseeing, it’s time to find somewhere for dinner. The centre of Vienna is overflowing with an array of restaurants, each serving tantalising cuisine to excite your taste buds and catering to all culinary preferences. With bistros to suit every price range, you don’t have to walk far to find somewhere that is perfect for you. For enticing Viennese cuisine, visit the Plachuttas Gasthaus zur Oper. 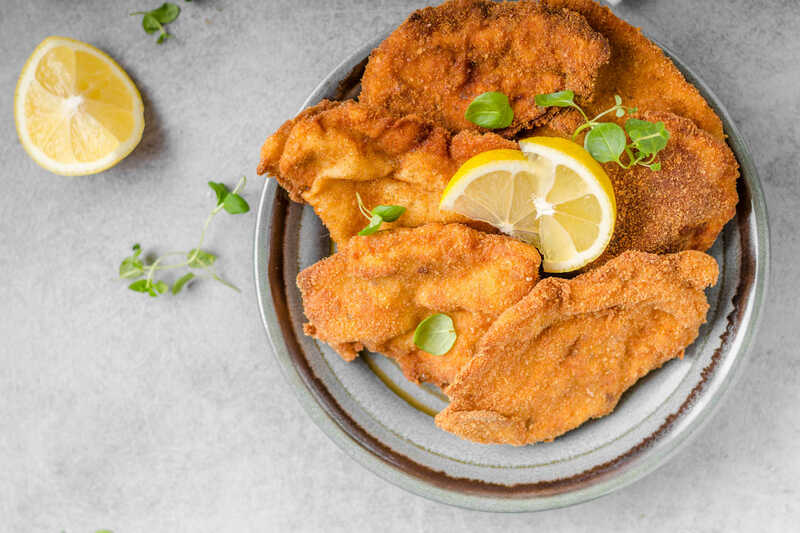 Indulge in a range of Viennese dishes, particularly recommended is the authentic Wiener Schnitzel made with the best cuts of veal and served with a delicious potato salad. Plachuttas Gasthaus zur Oper is open daily from 11:00am to 00:30am, kitchen closes at 11:15pm and reservation is recommended. Just outside of the city, lies the popular attraction and a UNESCO world heritage site, Schonbrunn Palace. Using your travel card, hop aboard Vienna’s city transport and enjoy the 10 minute ride towards the palace. For direct transportation journey on the underground (U4). 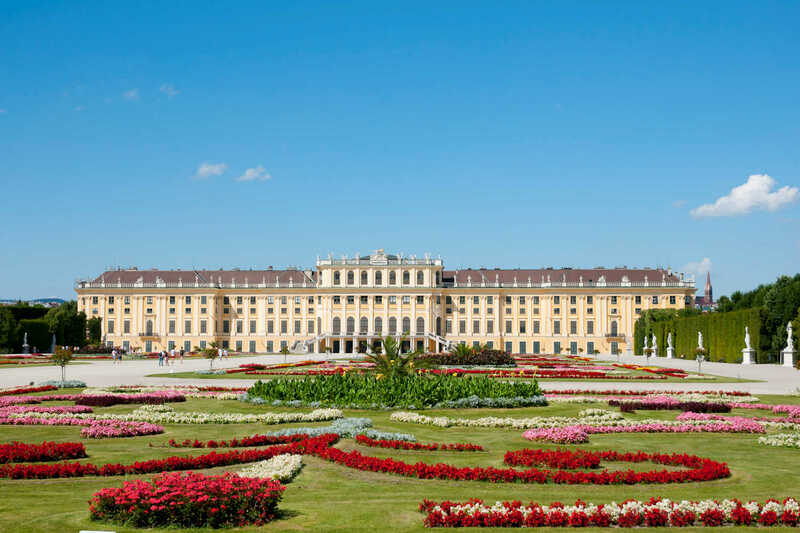 A popular attraction and a UNESCO world heritage site, Schonbrunn Palace and gardens offers an insight into the extravagant lives lead by past royalty. Over the course of the 18th century, Schonbrunn Palace grew into a palatial imperial residence, with its long history resulting in the creation of a spectacular building with breath-taking interiors. Tours around the palace are popular, so it’s best to arrive early to beat the queues. Tours around Schonbrunn Palace are recommended as they allow you to admire the magnificent grandeur of the palace’s many rooms. Surrounding the palace are vast, beautifully manicured gardens. Free to enter, the gardens are a wonderful place to spend time with a variety of gems to explore, including the Great Parterre, a maze, fountains, Roman ruins and a zoo (the zoo has an entry cost). Break up your visit by enjoying a light lunch in one of the cafes or restaurants on site, but don’t give in to your sweet tooth just yet, as scheduled for later is Vienna’s home of devilishly divine sweet treats. Schonbrunn Palace opening times include 1st April to 30 June 8am – 5:30pm, 1st July to 31st August 8am – 6:30pm, 1st September to 31st October 8am – 5:30pm, and 1st November to 31st March 8am – 5pm. Tickets for the Grand Tour are €17.50, and Schonbrunn Zoo €20; both free with the Vienna Pass. When you finish exploring Schonbrunn Palace, journey with your travel card back to the city centre, take the underground (U4) for a direct transfer. For opera enthusiasts, book a tour of Vienna’s opera house, Wiener Staatsoper. Offering a glimpse behind the scenes of the world’s largest repertoire theatre, uncover the secrets as to what goes into the creation of these operatic works of art. Opera House Tours are available every day of the week, with reservation available online, tickets cost €9 for adults, €7 for 65s and over, and €4 for children, students and apprentices (up to 27 years of age). 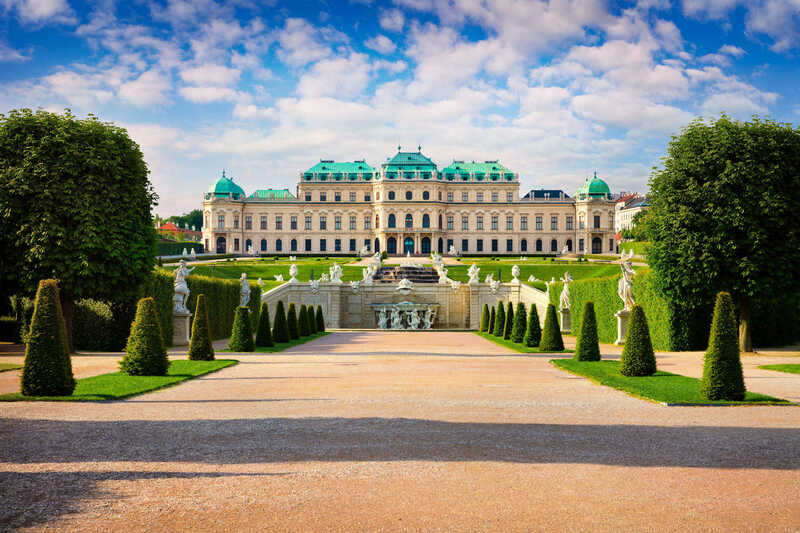 Alternatively, on your return from Shonbrunn Palace, take a detour to Belvedere Palace. Home to Gustav Klimt’s painting, The Kiss, take time to marvel at the diverse selection of art on show. Opening times include, 9am to 6pm daily for the Upper Belvedere (9am to 9pm on Fridays), and 10am to 6pm daily for the Lower Belvedere, Orangery and Palace Stable (10am to 9pm on Fridays). Next on your list is Vienna’s most attractive coffeehouse. Frequented by many famous names including Trotsky, Freud, Polgar, Zweig and Altenberg, Café Central leaves a lasting impression on its guests with its lavish interior inspired by Venetian Trecento-era architecture. 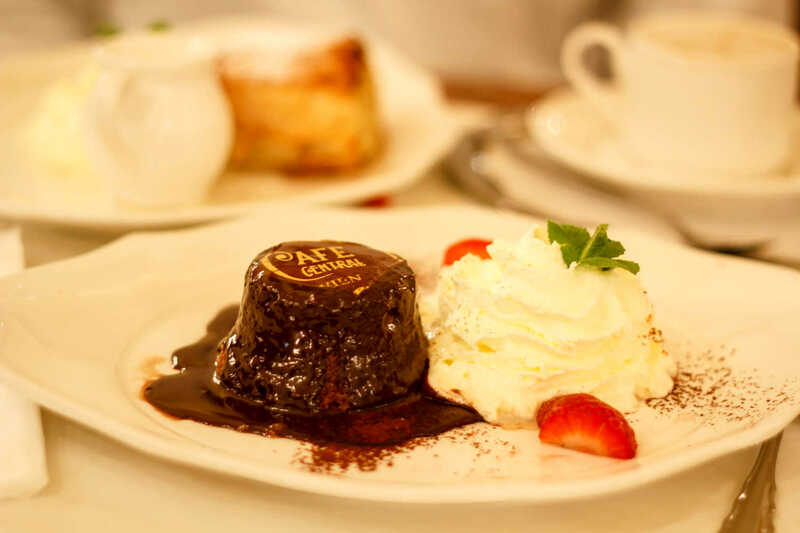 Serving an array of classic Viennese dishes, traditional coffee specialities and sweet treats from its in-house patisserie, this is the ideal place to treat yourself. Café Central is open Monday to Saturday 7:30am – 10pm, Sunday and public holidays 10am – 10pm, with piano entertainment daily from 5pm to 10pm, December 24th it is closed and December 31st open from 7:30am to midnight. And now to end your stay with a truly unmissable experience, treat yourself to a show at the Wiener Staatsoper (Vienna Opera). Attend an evening performance and delight in the dulcet tones and spellbinding storytelling that takes place. Evening shows vary in their timings, starting from 6pm onwards, visit the Wiener Staatsoper website for information on upcoming performances. Have you been to Vienna? We’d love to hear your stories, get in touch in the comments below.